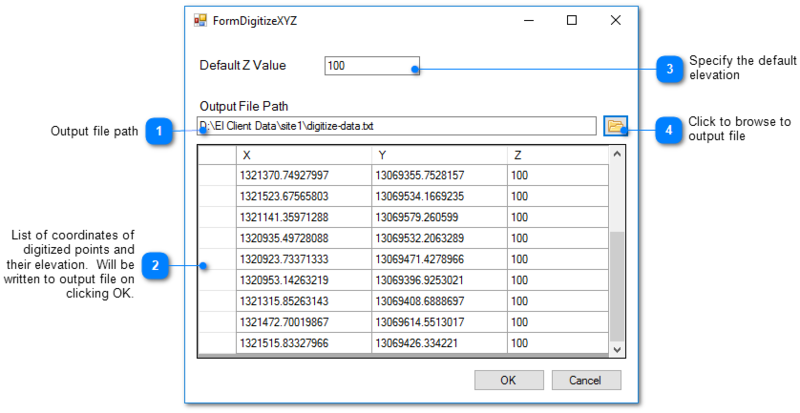 Select Edit> Digitize from the main menu to obtain coordinates for a set of points and save to a text file. The FormDigitizeXYZ dialog box opens. Move the mouse cursor to the location to digitize and click the left mouse button. A record of the location will appear in the dialog box. Digitize as many locations as desired. The X and Y coordinate are from the map coordinates. The Z coordinate is a specified default value, unless manually changed. Specify the output file and click the OK button to save to file.